Here are the most alluring matchups, stories, and personalities in Major League Baseball for the coming weekend. It’s an interleague play weekend, which means we get to see some interesting individual and team matchups. As you’ll see, the NL East vs. AL East showdowns steal the show. 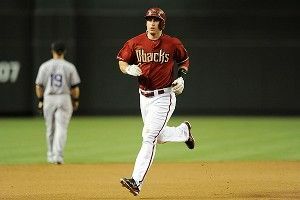 The Diamondbacks first baseman, who was already having a nice year, has turned it on over the past seven days to become the hottest player in baseball. In that stretch, he’s gone 9-for-19 with three home runs and four doubles to lead the D-backs to four wins. But who is Goldschmidt? He’s not technically a rookie, since he appeared in 48 games for Arizona last season, but at 24, he’s pretty close. His biggest claim to fame so far was hitting a grand slam in last year’s playoffs that helped Arizona stave off elimination against Milwaukee in a series the Brewers would go on to win in five. This weekend, he’s facing Oakland, which is coming off an incredibly surprising 3-1 series win against the Rangers. Take special note of Jarrod Parker, pitching Saturday for the A’s. He’s riding an 18-inning scoreless streak. Burnett is 3-0 in his last three starts. As a Yankees fan, this is more than just a little annoying for me. He was a walking implosion during his pinstripe years, and when he immediately fractured his orbital while trying to bunt in practice for the Pirates, it seemed like nothing would change. But after a rocky start, he’s starting to come into form. The Pirates have won the last six games he’s started, and A.J. has four straight decisions in his favor. Look, I’m not saying this will inspire Pavano-level bitterness in my heart, but I do hope Kansas City scores 19 runs against him and has him deported to Canada. Time to stop pretending that anything else is happening this weekend. As we saw Thursday, the two eastern divisions are by far the best in baseball. AL East teams have a .585 winning percentage outside their division, while the NL East is a close second at .580 (numbers as of Thursday morning). Among the 10 teams, there’s exactly one (the 28-31 Phillies) with a record below .500. This weekend, all 10 are meeting for bragging rights, and I’m going to take a shot at glory by predicting the results. Rays take two of three against Marlins, Braves two of three against Blue Jays, Yankees sweep Mets, Phillies take two from the Orioles, Nationals sweep the Red Sox. If I’m right, you can never question me again. On anything. And that’s a big deal, because I think the moon is fake. Orioles-Phillies is somehow the least appealing of the five East v. East engagements, and it’s still an awesome series. In our black hearts, we all suspect that Baltimore is a phony, and the team’s -4 run differential thus far gives some credence to that idea. The Phillies have hit a season-long snag and are currently in a six-game tailspin. It seems like a great chance for the O’s to gain a little credibility, which has to be sort of terrifying for their fans, because if they lose, it could be the first sign of the spiral we’re all expecting. The gem of this series is Cliff Lee (2.92 ERA) vs. Jason Hammel (2.97 ERA) on Sunday. I wouldn’t miss it! But I’m going to have to, since the inane MLB blackout means I can’t watch any Orioles or Nationals games down here in North Carolina, six hours to the south. Any time a Yankees-Mets showdown is the fourth-most exciting series on a given weekend, you know you’re in for a good time. The Mets’ red-hot R.A. Dickey is not pitching, unfortunately, which means the highlight is Santana-Kuroda tonight. Here’s some history for you: Including the 2000 World Series, the Yankees are 53-36 against the Mets. Also, this series is a godsend for New York baseball, because there’s a slight problem — nobody’s coming. It’s terrible to be Toronto, isn’t it? Even when you build your franchise the right way, following all the rules, you still have to contend with New York, Boston, and Tampa every single year. And when one of them seems to be struggling, as with the Sox this year, all the sudden the g***amn Orioles are in first place. THE ORIOLES. Still, Toronto is only two games back, and Colby Rasmus is hitting the stuffing out of the ball over the past two weeks. For Atlanta’s part, it is riding a four-game win streak that’s landed the Braves just a game south of the division-leading Nationals, and they should have a distinct edge tonight with Brandon Beachy, the league ERA leader (1.87), on the mound. The Romero-Hudson matchup Sunday could be a dandy. The second- and third-worst fan bases from last year (thanks, Oakland!) meet up in this epic storm of spectator indifference. But we real fans are not indifferent — Tampa salvaged a game against the Yanks on Thursday night to stay in first place in the AL East, and Miami is only two games away from their own division lead. With Jeremy Hellickson and Matt Moore pitching on Friday and Saturday, both boasting sub-3 ERAs the past two weeks, the Rays look to have a paper advantage. But hey, watch out for the Big Z, Carlos Zambrano, on Saturday! Ozzie may have found the necessary magic to purge him of his headcase past and lead him back to top form. My guess is that he’ll help the Fish earn a split of the first two games, and it will come down to Sunday’s matchup: Big Game James Shields vs. Anibal Sanchez. Hey, Boston, good news. You guys like challenges, right? Well here’s one: Face Stephen Strasburg, Gio Gonzalez, and Jordan Zimmermann in three straight games. No big deal. They’ve only got 16 wins between them, and Strasburg and Gonzalez pass the time by making fun of Zimmermann’s 2.82 ERA, since they’re at 2.35 and 2.31, respectively. And Boston’s counters? The competent Felix Doubront, Dice-K in his first major league start since shoulder surgery last year, and a struggling Jon Lester. It could be a blood bath, and I can’t wait to settle in and really enjoy every single min — oh wait, no. Blackout. Screw you, MLB. Screw. You.